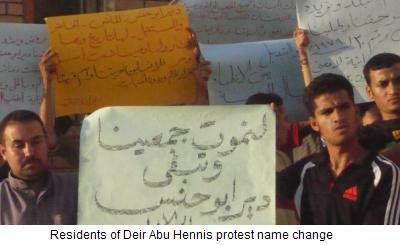 (AINA) -- The Egyptian Government, In a new step in long-term and premeditated process of obliterating Coptic identity and history, has decided to change the name of the Coptic village of Deir Abu Hennis, in the Upper Egyptian province of Mallawi, Minya. The village was founded in the 4th century AD on the grounds of the Monastery of St. Hennis the Short, a much revered Coptic Saint. The new name chosen by the Government is "Valley of Peppermint." More than four thousand Coptic villagers demonstrated on Thursday June, 11 against this forced change, vowing to fight to the end to keep the name of their village. They carried banners with slogans such as 'Let us all die and May Abu Hennis live for ever' and "We, the inhabitants of the village refuse the change in the name of our village and we want it to remain as it is. It is our right and our demand"
The inhabitants of the village, who are 100% Copts, are not only angry because the Minister of Justice,issued an order to change the name of their village into "Valley of Peppermint," but because this decision was made on 4/12/2009, but they were informed on 6/9/2009. Upon hearing of the news, the Copts in Deir Abu Hennis village sent on 6/9/2009 a plea to all concerned authorities and Coptic NGOs, expressing their anger at this decision. They made a petition which was signed by 35,000 village inhabitants. They believe that this change in the names of Coptic villages is premeditated and did not come as a result of a whim on the part of the local council, otherwise why does the Minister of Justice get involved, even though this does not gall under his jurisdiction. In an effort to pacify the villagers, the Governor of Minya immediately contacted the director of Mallawi City Council and sent him to the village to try and calm the angry crowd, and promised to reverse decision of the Minister of Justice to change the name of the village. However, he told them that this will require some time and promised to try to have this done by next Thursday. Attorney Dr. Naguib Gibraeel, President of the 'Egyptian Union' Organiztion for Human Rights filed a petition against the Minister of Justice, the Governor of Minya, the Minister of Culture and the Prime Minister in his capacity as head of ministers and governors, to stop the change in the name of the village of Deir Abu Hennis. His plea was founded on grounds that this decision is an obliteration of the Egyptian identity and the Coptic history as an integral part of the history and civilization of Egypt. Numerous Egyptian satellite channels including OTV, owned by Coptic tycoon Saweiress, filmed the demonstration and interviewed the demonstrators. According to Free Copts reporters, State Security tried to prevent the media and attempted to confiscate the video tapes, but were prevented fom doing so by the villagers. The government tried previously in 1964 to change the name of the same village, also to "Valley of Peppermint", but faced with the villager's opposition, it reversed its decision and the order was cancelled through a Presidential decree issued in 1979. Dr. Gibraeel has been protesting for several years against the changing of Coptic names, whether of streets, squares or areas and substituting them with Islamic names, which has been going on for some time, and spreads all over Egypt from Aswan to Alexandria. To raise awareness of this on-going phenomenon, he previously filed petitions against the Governor of Cairo for substituting Coptic names of places of interest with Muslim ones around Cairo. Coptic Bishop Thomas of El-Qussia Diocese, Upper Egypt, gave a lecture last July at the Hudson Institute entitled "The Experience of the Middle East's largest Christian community during a time of rising Islamization." He talked about the dilemma of the Copts who kept their Christianity, and identity as Egyptians who have their own culture, in the face of their fellow citizens who have adopted an Arab culture and identity. "Now when you look at a Copt, you don't see only a Christian, you see an Egyptian who is trying to keep his identity versus another imported identity that is working on him," he said. As a reaction to this lecture more than 200 articles appeared in the Egyptian Media attacking Bishop Thomas, asserting the Arab and Islamic identity of Egypt, others called for putting him on trial charged with 'treason', while one Imam called for his death. Dr. Gibraeel also appealed today to the Culture Minister Farouk Hosni, responsible for safeguarding the cultural heritage of Egypt, asking for his intervention. A meeting is scheduled between them on Thursday, 6/18/2009. The village of Abu Hennis is placed on Egypt's tourist map, and tourists come from all over the world to visit it as part of the history and culture of the Copts of Egypt going back to the 4th century AD. "It represents an assault on the country's national wealth, and gives rise to sectarian tensions, as the name of Deir (Monastery) of St. Hennis the Short, is a source of religious pride to the Copts, and part of the history of the martyrs of the Coptic Orthodox Church," he said. As a warning, Dr. Gibraeel vowed that if this matter of Deir Abu Hennis village is not resolved, he would bring the matter to UNESCO, being the responsible authority for safeguarding cultures and civilizations. This would be a source of great embarrassment to Egypt and its Minister of Culture who is presently one of the contenders for the President of UNESCO, while in his own country 600 years of Coptic history and culture is being obliterated.